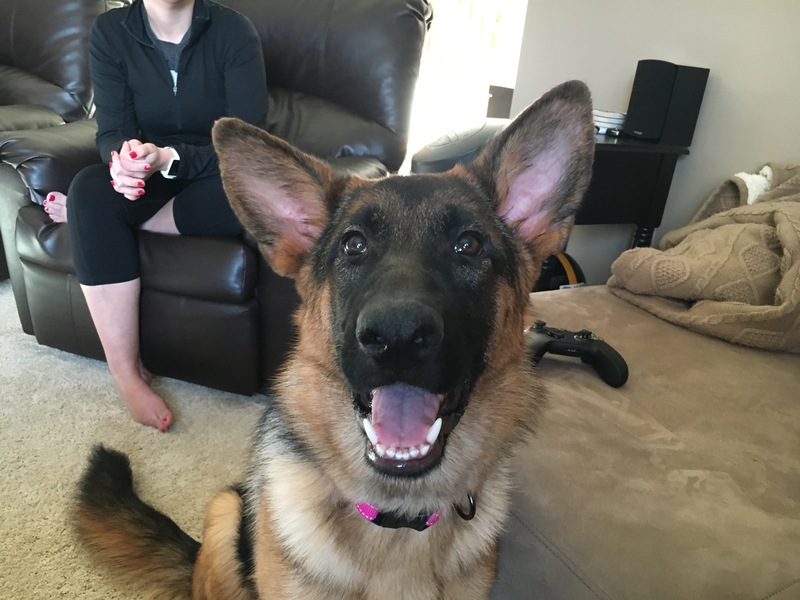 Lucy is a seven-month-old Female German Shepherd puppy who lives in Omaha. Her guardians booked a puppy behavior training session with me to address her leash aggression towards other dogs, mouthing and nipping their younger son when playing and getting over excited when humans arrive home, jumping up on them. Lucy showed good confidence and energy when I arrived for the session which is always what you want to see in a puppy. She did get a little nippy / mouthy so I spent a few minutes sharing some puppy training tips with her guardians to stop nipping and stop mouthing. The technique I use to discourage nipping and mouthing is to yelp loudly any time the dog’s teeth touch my skin, even if it was accidental. This approach caught Lucy off guard and actually cased her to move away. If the guardians all practice the same technique, it shouldn’t take Lucy long to learn that if she nips or mouthes a human, they will stop playing with her. If the timing is right (immediately), it shouldn’t take long before Lucy stops nipping hands when excited. I sat down with Lucy’s guardians and chatted for 30 minutes or so on her unwanted dog behavior and the things they were doing that may be confusing her or sending the wrong message. Not petting the dog when excited or in any unbalanced state will be important for the humans to remember when they arrive home or engage in any action that really gets Lucy worked up. I showed them how to disagree with her using non verbal communication cues rather than verbally correcting her. Suggested they come up with a naughty dog name, showed them how to add a little structure to petting her to help her develop more respect for them as well as how to use passive training to harness the power of positive dog training to motivate Lucy to engage in desired actions like sitting to ask for attention instead of pawing, demand barking or jumping up. Once the basics were covered, I was ready to address Lucy’s leash aggression. I use a technique that trains the dog to look up at the handler’s face on command. I call this a Focus exercise. As I mentioned in the above video, this technique is something I got out of a book written by my mentor Karen London. The book, Feisty Fido is short, easy to read and most of all very effective. It will be important that the guardians practice the Focus exercise in short 1-2 minute training sessions multiple times a day inside for a week or so before they transition to outside where there are more distractions. Continue to enforce the rules and boundaries already in place (within 3 seconds) using the new nonverbal communication techniques. Start paying attention to personal space and helping Lucy learn to respect a one foot bubble unless invited to get closer. Look for additional rules that help Lucy practice self control and build up more respect for her guardians as authority figures. Recreate situations where Lucy demonstrates undesired behaviors and teach her how to behave for each individual step separately under a controlled situation. Get into a habit of petting with a purpose to help her transition into more of a follower’s mindset. Use passive training to reward Lucy with positive reinforcement when she engages in desired actions or behaviors. Remember to pet her within 3 seconds while ONLY saying the command word. Avoid using the expression “good dog” and use the command word instead. Try to et Lucy under her chin instead of on top of her head. Practice the recall or come command a few times a day while rewarding her to motivate her to come when called in the future. Come up with a naughty dog name and use that when she misbehaves to avoid adding a negative association with her name. Practice the Focus exercise in short 1-3 minute training sessions as outlined in the video. Progressively make the Focus exercise more difficult and go at the dog’s pace. Always end on a good repetition. Avoid contact or exposure to other dogs on walks while developing the Focus exercise. If necessary drive to a new location or walk at times of day when the odds of seeing other dogs are lower. Introduce and practice the U turn when on walks without a dog present, so she has a plan B any time they run into a dog unexpectedly. Use the Martingale with the special twist of the leash to have better control on walks. Remember to not pull Lucy into position with the leash. Only tension should be when correcting her and in that case, tension should only be there for a fraction of a second. Start taking Lucy to a dog park and find a distance where she can see the dogs inside, but still sit and eat a treat, then start walking her around the exterior of the dog park at that distance. Once Lucy can walk around the park calmly, start gradually decreasing the distance between Lucy’s path and the dog park fence. Over the course of a few weeks she should be able to walk right against the fence without stress or reacting to the dogs inside. Once Lucy is comfortable walking around the dog park, start taking her inside. Look for times when there are fewer dogs. If possible find a time when no dogs are inside to let her explore the area on her own. Set Lucy up for success by taking her out for a long walk 20 or more minutes before her first few trips inside the dog park to help reduce her excess energy. Add structure to meal times, eating after the humans and only with permission to go tot he food waiting for her in her bowl on the floor.